The Bible never specifically says there is a “Trinity” or that “the Holy Spirit” is a “Person in the Godhead.” We assert that is because the Bible teaches there is the Father, Son, and holy spirit (the gift of God), but they are not all “God,” neither are they “co-equal” or “co-eternal” as the doctrine of the Trinity states. In contrast, Trinitarians argue that there was no need for Scripture to say, “There is a Trinity,” because everyone knew it. Historically, what we today know as the doctrine of the Trinity was not clearly codified until the 4th century A.D.
(1) The “breath” of God and the “spirit” of God are synonymous terms, a point that is easily seen in the original text, but not always so obviously translated (Job 4:9, 27:3; Ps. 33:6, 104:29 and 30; John 3:8; 2 Thess. 2:8;). The breath of God is not a distinct person from God any more than the breath of a human could be a person distinct from that person. (2) The “spirit of God” is synonymous with the hand and the finger of God, which can be seen from the fact that, referring to the same thing, they are used interchangeably (Job 26:13 KJV; Ps. 8:3; Matt. 12:28; Luke 11:20). This is strong evidence that “the Holy Spirit” is the name of God when His power is in operation. If God and “the Holy Spirit” were two co-equal “Persons,” it would not make sense to understand “the Holy Spirit” as the “hand” of God. As a man’s hand and finger are subordinate and submissive to the will of a man, so the spirit of God is subordinate to the will of God. As what is done by the hand of a man is done by the man himself, so what is done by the spirit of God is done by God Himself. (3) In Matthew 11:27 (KJV) Jesus says that “…no one knows the Son, but the Father; neither knoweth any one the Father, save the Son….” If the doctrine of the Trinity were correct, and “the Holy Spirit” is a “Person” in the Godhead, then He too would have known the Father and the Son, and Jesus’ statement would not have been true. (7) The spirit God gives is said to be divisible and distributable. God took of the spirit that was upon Moses and placed it upon the 70 elders of Israel (Num. 11:17–25). Joel 2:28, quoted by Peter on Pentecost (Acts 2:18 KJV), says that God “…will pour out in those days of my Spirit [spirit]….” Understood literally, the Greek says “some of,” or “part of” my spirit. The footnote in Weymouth’s translation reads “literally ‘of’ or ‘from’ my spirit—a share or portion.” Though we cannot conceive of how a person might be so divided, we can understand that the spirit of God (the spirit that comes from God), as the nature and power of God, can be distributed among many. (8) The “holy spirit” is clearly said to be given by God to men. A divine “person” cannot be given or bestowed by another divine person, because to be given is to be under the authority of another. If “the Holy Spirit” were co-equal with the Father, “He” would not be under His authority. (9) The spirit of God is, by definition, derived from God. That is why 1 Thessalonians 4:8 says that holy spirit is God’s: “…God, who gives you his Holy Spirit” (1 Thess. 4:8b). If “the Holy Spirit” were a “co- equal,” “co-eternal” part of a triune Godhead, this verse makes no sense. It could not refer to “the Holy Spirit” as being God’s. (10) “The Holy Spirit” is equivalent to “…the power of the Most High…,” as Luke 1:35 clearly indicates by the use of parallelism (cp. Luke 24:49; Acts 1:8, 10:38; Rom. 15:13, 18 and 19; 1 Cor. 2:4 and 5). The context is the conception of Jesus Christ. Matthew 1:18 also records that Mary “…was found to be with child through the Holy Spirit.” Yet all through the Christian Scriptures are references to the fact that God is the Father of our Lord Jesus Christ. The reason that “the Holy Spirit” is said to father the Lord, but God is the Father of the Lord, is that “the Holy Spirit” is the name used of God that emphasizes His active power. (11) John 7:39 says that until Jesus was glorified, there was no holy spirit.2 Furthermore, in Acts 1:4 and 5 Jesus tells his disciples to wait for “the gift my Father promised…,” which would come “in a few days.” If the Holy Spirit were a person, and present in the Hebrew Scriptures, how then is it possible for “Him” to be spoken of as not yet being in existence? This problem is solved when we understand that the spirit of God that we receive is not a separate person, but rather the gift of God to empower His people, and that what we have today was not in existence during the Hebrew Scriptures or Gospel periods. (12) The Holy Spirit is never worshiped as the Father and the Son are, nor does any verse of Scripture command such worship. (13) In the opening of their Christian Scriptures epistles, every one of the writers identifies himself with God the Father and the Lord Jesus Christ, but not one does so with “the Holy Spirit” (Rom. 1:7; 1 Cor. 1:3; Gal. 1:3). (14) In the Church Epistles (Romans through Thessalonians), the apostle Paul sends personal greetings from “God the Father and the Lord Jesus Christ.” If “the Holy Spirit” were an integral and personal part of a triune Godhead, then surely he would have sent personal greetings as well. The fact that nowhere does “the Holy Spirit” send greetings to the Church is good evidence that he does not exist as a distinct being. (15) When Paul does include additional persons in his greetings, salutations and adjurations, he names the elect angels, not “the Holy Spirit” (1 Tim. 5:21; cp. Luke 9:26 and Rev. 3:5). (19) When Jesus prayed to the Father, he called Him “…the Lord of heaven and earth…” (Matt. 11:25). The Father would not be “the Lord” (singular) if “the Holy Spirit” were also a co-equal with the Father. The most logical reason why Jesus did not mention “the Holy Spirit” being lord with the Father is that there is no such being. (20) When Jesus prayed to the Father in John 17, he called Him “the only true God” (John 17:3). The fact that Jesus does not mention “the Holy Spirit” as part of the true God is good evidence that such a being does not exist. (21) Scripture says that a person who is antichrist “…denies the Father and the Son” (1 John 2:22b). Surely if there were a Trinity of “co-equal,” “co-eternal” Persons making up the One God, then an antichrist would be said to deny the Trinity, or the Father and the Son and the Holy Spirit. (22) Jesus taught his disciples that “the Father loves the Son and has placed everything in his hands” (John 3:35). If “the Holy Spirit” exists as an equal part of God, Jesus should have said that the Father and “the Holy Spirit” love the Son. In fact, “the Holy Spirit” is never said to love the Son. (23) Jesus made a distinction between himself and “the Holy Spirit,” saying that if someone spoke against him it could be forgiven, but that blasphemy against “the Holy Spirit” would never be forgiven (Matt 2:32). However, he never mentions “God” or “the Father.” This is very good evidence that “the Holy Spirit” is another name for God, because it is unlikely that Jesus would omit the Father in that context. (25) Jesus taught: “…I tell you the truth, the Son can do nothing by himself; he can do only what he sees his Father doing, because whatever the Father does the Son also does” (John 5:19b). If “the Holy Spirit” were a “co-equal” being with the Father, involved in reigning over the universe, then surely Jesus would do what he saw both the Father and “the Holy Spirit” doing. The fact that Jesus never said he followed the example of “the Holy Spirit” is good evidence that such an independent being does not exist. (26) Jesus said to the crowds, “Do not work for the food which perishes, but for the food which endures to eternal life, which the Son of Man shall give to you, for on Him the Father, even God, has set His seal” (John 6:27 NASB). The first thing we learn from this verse is that Jesus called the Father “God.” He apparently did not think of God as a Triune being of which he himself was a part. Furthermore, if “God” were composed of both the Father and “the Holy Spirit,” then Jesus would have been sealed by them both, but “the Holy Spirit” is never mentioned. (27) Exodus 23:20 mentions the angel of God’s presence that would go before Israel in the wilderness. God has permitted angels to represent Him by speaking as if they were God Himself, and even to use His personal name, Yahweh. A few examples of this principle are Manoah and his wife (Judg. 13:21 and 22), Jacob wrestling (Gen. 32:1 and 30; Hosea 12:3–5), Moses (Exod. 3:2, 6 and 16), and Gideon (Judg. 6:12, 13, 16, and 22). What is sometimes attributed to Jesus or to “the Holy Spirit” in the Hebrew Scriptures is better explained by this principle of God manifesting Himself by means of an angelic messenger who speaks for Him in the first person (“I, the Lord,” etc.) and manifests His glory. (28) Though the Hebrew word for “spirit” (ruach) can refer to angels or evil spirits, which are persons or entities with a personality, the Hebrew usage of “the spirit of God” never refers to a person separate from, but a part of, God. Neither does the phrase, “the spirits of God,” occur in a way that cannot be explained by God having angels (spirits) at His command rather than separate spiritual entities within a multipersonal God. For example, Revelation 1:4 refers to the “seven spirits” before the throne of God. However, there is no reason not to take the verse literally and believe that these are seven actual spirits who serve God and the Lord rather than a unique and confusing way to refer to “the Holy Spirit” or a triune Godhead. (30) People have argued that the “spirit of truth” in John 14:17 is a person. If this is true, then “the spirit of error” in 1 John 4:6 (KJV) would also have to be a person, since the two are directly contrasted. The better explanation is that each “spirit” represents an influence or power under which a person acts, but neither is a person in itself. (31) The “Spirit [spirit] of your Father,” is synonymous with “the Holy Spirit,” and is said to speak in our stead on certain occasions when we might be brought before men for possible persecution or trial (Matt. 10:19 and 20; Mark 13:11; Luke 12:12). On the same topic, Luke 21:15 says that Christ will give us “…a mouth and wisdom, which all your [our] adversaries shall not be able to gainsay or resist.” Rather than saying that a person called “the Holy Spirit” will speak through us, these verses teach that we will be inspired by the supernatural power of God and Christ to speak as they give us guidance. (32) The spirit of God is referred to as “the helper” (sometimes known as “the Comforter” or “Counselor”) in John 14:16, 26, 15:26, and 16:7. “Helper” is a masculine noun, so masculine pronouns are used with it. However, it is clear from Christ’s teaching that the helper is not a person. John 14:26 calls it “the holy spirit,” and its attributes match those of the gift of holy spirit. It was “with” the Apostles, but would be “in” them (John 14:17), which is what happened when holy spirit went from being with or “upon” people in the Hebrew Scriptures and Gospels to being “in” people in the Church and the Millennial Kingdom. The helper (the holy spirit) is sent by the Father (John 14:26) and Jesus (John 16:7), and it does not speak on its own, but it speaks “only what he [it] hears” (John 16:13). Nevertheless, there are distinct overtones of the figure of speech personificationin John, which occurs when the qualities of a person are attributed to things that have no personality or consciousness.4 “Wisdom” is personified in Proverbs 8 and 9, for example. In Isaiah 14:8 (KJV) the trees are said to “rejoice” and speak. The gift of holy spirit is the nature of God, and as such it works in us, in conflict with our sin nature, to form us into the image of Christ. So, personifying it and saying that it guides, teaches, speaks, etc. is highly appropriate. (33 Jesus said that the “helper” would fill the void created by his going to the Father (John 14:12). Yet, by this spirit, he was the one who would still be present: “…I will come to you” (John 14:18); “I am in you” (John 14:20); and I will “show myself” (John 14:21). By this spirit, his work with them would continue: it “will teach you” (John 14:26); it “will remind you of everything I have said…” (John 14:26); it “will testify about me” (John 15:26); it “will guide you into all truth…” (John 16:13); it “…will bring glory to me by taking what is mine and making it known to you” (John 16:14). It seems clear that the “helper” is not someone other than Jesus but rather a way that Jesus himself can be present. It makes sense that “the holy spirit” is the gift of God that allows Jesus to be present with us and in us. (34) All of these statements point to the role of the gift of holy spirit in continuing the work that Jesus started and even empowering his followers for greater works. This spirit is not independent and self-existent but is “the mind of Christ” within the believer, guiding, teaching, reminding, and pointing the believer to follow his Lord and Savior. This spirit is not “co-equal” when by its very design it is subservient to God and Christ. It carries the personal presence of God and Christ into the life of every believer. (36) Many words associated with God’s spirit give it the attributes of a liquid. Such language is consistent with the spirit being God’s presence and power. We are baptized (literally “dipped”) with and in it like water (Matt. 3:11; Acts 1:5). We are all made to “drink” from the same spirit, as from a well or fountain (1 Cor. 12:13). It is written on our hearts like ink (2 Cor. 3:3). We are “anointed” with it, like oil (Acts 10:38; 2 Cor. 1:21; 1 John 2:27). We are “sealed” with it as with melted wax (Eph. 1:13). It is “poured out” on us (Acts 10:45; Rom. 5:5). It is “measured” as if it had volume (2 Kings 2:9; John 3:34 KJV). We are to be “filled” with it (Acts 2:4; Eph. 5:18). This “filling” is to capacity at the New Birth and to overflowing as we act according to its influence. Even the use of spirit as “wind” implies a liquidity, for air masses behave as a fluid, flowing from areas of higher to lower pressure. All this figurative language is designed to point us to the truth that the spirit of God is the invisible power and influence of God. 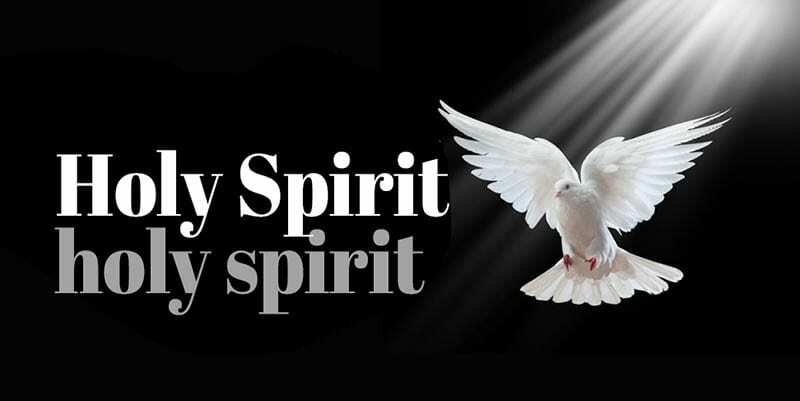 (38) The term “Holy Spirit” (properly “holy spirit”) is used synonymously and interchangeably with “the spirit of Jesus” (Acts 16:7); “the spirit of the Lord” (Luke 4:18, etc. ); “the spirit of his son” (Gal 4:6); and “…the spirit of Jesus Christ…” (Phil. 1:19). In this usage, “the spirit” is the active power of Jesus Christ, who fills believers with holy spirit and then, through it, guides them to do the will of God. He is, after all, the expert in how humans can be brought to obey the will of God without coercion or intimidation. The following are examples of the interrelationship and interdependence between Jesus Christ and the spirit. (A) Acts 13:2 (ASV) says, “…The Holy Spirit said, Separate me Barnabas and Saul for the work whereunto I have called them.’” Later, in Acts 16:6, amidst the work Paul was called to, “the Holy Spirit” kept Paul and his companions from preaching in Asia. Verse 7 says that the “spirit of Jesus” would not allow them to enter Bithynia. (B) 2 Corinthians 3:17 and 18 says that the Lord (Jesus) is “the Spirit.” This is an appropriate reference to Jesus now that he is in his new, spiritual body. He has been invested with all spiritual authority and power to effectively carry out his responsibility as the Head of his Body. By his “spirit,” he is able to guide and direct his many servants. (D) We are sanctified by the spirit (2 Thess. 2:13); we are sanctified in Christ Jesus (1 Cor. 1:2), whom God made to be sanctification for us. (E) The gift of holy spirit is the helper (parakletos); we have an advocate (parakletos) with the Father, Jesus Christ the righteous (1 John 2:1 KJV). (F) We are strengthened by the spirit in the inner man (Eph. 3:16); Christ dwells in our hearts (Eph. 3:17). (G) We have access to the Father by the spirit (Eph. 2:18); in Christ and through faith in him we have confidence and access to God (Eph. 3:11 and 12). (H) The spirit apportions to each one individually as he wills (1 Cor. 12:11); The Lord Jesus pours out the spirit (Acts 2:33) and gave some to be apostles, some to be prophets, etc. (Eph. 4:11). (I) The spirit intercedes for us (Rom. 8:26); Christ Jesus intercedes for us (Rom. 8:34). (J) The Spirit says to the churches…(Rev. 2:7); The revelation of Jesus Christ…to show to his servants… (Rev. 1:1). (39) Many Trinitarians assert that “the Holy Spirit” comes and permanently dwells within a believer when he accepts Jesus Christ as his Savior. But many also teach that “the Holy Spirit” comes upon a believer after he is born again. They also pray for “the Holy Spirit” to attend their meetings, and welcome “Him” to come as “He” desires. This puts them in the difficult position of having to explain how a Christian can have the “person” of “the Holy Spirit” simultaneously dwelling in him while at the same time coming and going from Christian meetings. (40) The gospel of Matthew has been said to show the Trinity. It says, “… baptizing them in the name of the Father, and of the Son and of the Holy Ghost” (Matt. 28:19 KJV). However, this verse is quoted in a different form by the early Church Fathers, notably Eusebius (340 A.D.), who quotes the verse at least 18 times as follows: “… baptizing them in my name.” This agrees with the testimony of the book of Acts and Paul’s Epistles, which associate only the name of Jesus Christ with baptism. Even if this verse reads as found in modern versions today, it does not mention the Trinity or say that the three are one God, or even that “the Holy Spirit” is a separate “person” from God. All it says is there is the Father, the Son, and the holy spirit, which we agree is correct. There is no reason to believe that “the holy spirit” refers to a “Person.” If the phrase is indeed in the original text, it refers to the gift of God. 1. These reasons are drawn from our own study of Scripture and from the work of James H. Broughton and Peter J. Southgate, The Trinity: True or False (“The Dawn” Book Supply, Nottingham, England 1995), from the work by Anthony Buzzard and Charles Hunting, The Doctrine of the Trinity; Christianity’s Self-Inflicted Wound (International Scholars Publications, New York, 1998), from Charles Morgridge’s book done in 1837, The True Believer’s Defense, from Fredric A. Farley’s book (1873) The Scripture Doctrine of the Father, Son and Holy Ghost, and from The Racovian Catechism (1605). Furthermore, we believe that Scripture is clear that Jesus is the Son of God, not God, which we discuss in our book, op. cit.,One God & One Lord: Reconsidering the Cornerstone of the Christian Faith. 2. That John 7:39 says holy spirit did not exist is explained in Chapter 6. 3. In the NIV, Philippians 2:1 refers to “fellowship with the Spirit.” A better translation of Philippians 2:1 is the KJV, which renders the phrase “fellowship of the Spirit [spirit],” pointing to the fellowship among believers who share a common spirit and who ought therefore to be able to get along with each other. 4. Bullinger, op. cit., Figures of Speech, pp. 861–869. 5. For more on this verse see our book: op. cit., One God & One Lord, Appendix A.